A few months ago, I saw an online tour of Andy and Alica Paulson's home and immediately raided the Christmas decoration box to string lights around one of the playroom doors. 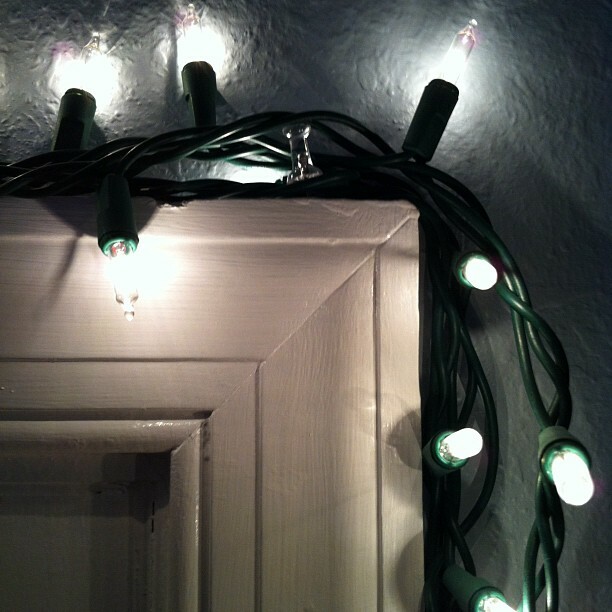 It is so cozy to plug in the lights on rainy days or in the darkening evenings on cold winter nights. It lends a bit of magic to the space and draws the children (and adults!) right in to play or read or draw. I plan on returning these tree lights to the Christmas box this coming December and replacing them with ones that are on white wires so that they blend a bit better. I may even go crazy and line the windows with twinkle lights then, too! I love this look! My parents have twinkle lights up at their house around the windows and it's just so sweet. Gives everything the greatest feeling. I'm still working to set some up in my house, but I love going back to visit and seeing the lights and just knowing that I've arrived to a homey place.